Another great get together with 50+ shipmates attending and 80 total gathered for the banquet/auction. An outstanding reception Thursday evening, hosted by Frank and Sally Cascini, started off a great weekend that went all too fast. Friday morning we headed off to the National Naval Aviation Museum to view 100's of aircraft in a truly remarkable display. That evening, Bill and Michele Keleher guided several volunteers in several skits that were recorded and made available on You Tube. The banquet and auction on Saturday evening was another great event. Bill Keleher and Jimmy Bunch are becoming expert auctioneers and they kept everyone on their toes as they auctioned all the wonderful auction items brought by our shipmates. Everyone said they had a great time and look forward to gathering again next year in Virginia Beach, VA. (4/23--4/26, 2015). We will be attending the Virginia International Tattoo on the 24th and more information on this event will be provided later. It is a show you will not want to miss. has continued to assist the Secretary/Treasurer in his duties. The minutes were accepted as published in the annual newsletter. Received and approved the report of the Secretary/Treasurer. was held about holding the 2017 STEINAKER Reunion in either San Antonio, TX, Branson, MO or Chattanooga, TN. these organizations have since thanked the STEINAKER crew for their generous donation and support. Introductions and acknowledgements were made: RADM Al Rieder, CO - USS STEINAKER - 76-78, CAPT Al Lawler 61-63, CAPT Larry I’Anson 58-61, CDR Chuck Spencer 66-69 “WesPac 68” and LCDR Bill Grason. There being no further new business - the meeting adjourned. We’re excited!!!! Just received word from CDR Hal Sacks CO of the STEINAKER during “WesPac ’68” deployment to Vietnam that his crew will be joining us for the reunion. The 2014 reunion attendee’s would like to say “Bravo Zulu” to Frank and Sally Cascini for hosting a “Great” Welcome Aboard Party at the Holiday Inn, Pensacola, Fl. 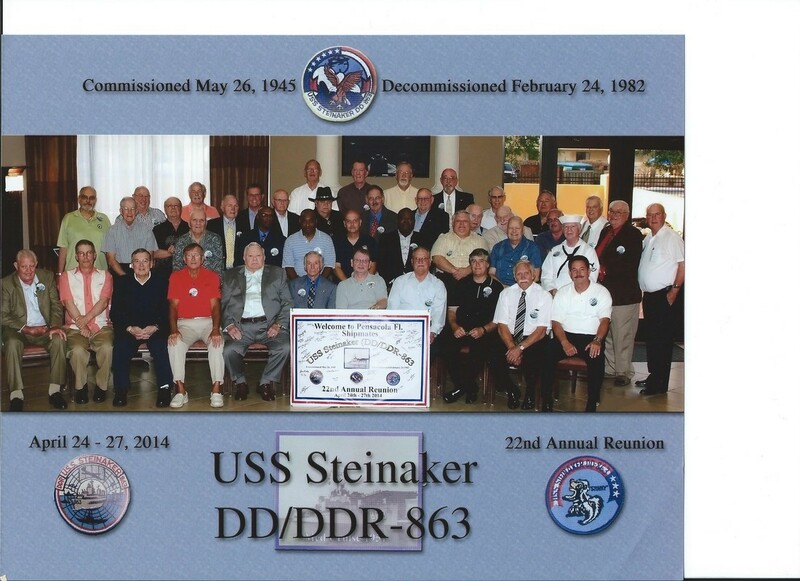 Frank and Sally Cascini have once again generously offered to host a complimentary “Welcome Aboard Reception” for all STEINAKER reunion shipmates at the 2015 reunion. The time to be reflected on your arrival package. The association will be assisting the Cascini’s in anyway possible to make this an enjoyable evening. During the reunion Captain Larry I’Anson made a generous donation to the STEINAKER Reunion Association. On behalf of all the STEINAKER shipmates - “Thank You” Captain I’Anson for all your support. Also once again - Bravo Zulu to Ken Kohnen for all his hard work. We wouldn’t be enjoying the current membership roster or all the other informational items at our finger tips - if it wasn’t for Ken. Ken has spent many hours gathering information and locating new shipmates. As usual.. words of thanks go out once again to our Historian “Bill Keleher” for his work on the reunion skits, awards, etc…….… His letter follows the reunion news/info…. The association still has some STEINAKER patches, plus the “Rocker Patch” available for sale. The packaged items are $10.00 for all (4) items. Individuals interested should contact “Russ Noble” at (231) 944-2148. If you would be interested in hosting one of our reunions, gather some information and bring it with you….remember the more that get involved the easier it is on the rest of us. SHIPMATES.. Remember we always have an auction at the banquet, so we request that everyone bring an item from their area and donate it for the auction… THANK YOU…. After breakfast on Friday, most shipmates opted for the Pensacola tour. This involved a trolley ride to the National Naval Aviation Museum. Harder seats on a public conveyance I have never experienced in this lifetime! Some suggested that as time has passed our generous padding has evaporated. I don’t know what the explanation was, only that I was really glad to depart the trolley and start walking. I have to tell you that this is one big exhibition. I think I walked 10 miles through that place. The number of aircraft was staggering and many of them I had never seen before. The tour also included an IMAX movie of the Blue Angels and lunch at the world renowned Cubi Bar Cafe. Some tour goers were able to experience the flight simulators that reproduced an actual Blue Angels display. I did think that my wife would emerge holding a brown paper bag but to my surprise, she wanted to go for a second try! Just make sure you get your popcorn and drinks, settle in and enjoy your shipmates in the performances of their lives. Make sure to watch all the way through the credits as there is important information at the very end. Saturday morning brought the inevitably important business meeting. Don’t complain, it has to be done. The introduction of all new and old attendees is always well received as there are usually some surprise late arrivals. Discussions were held concerning the next couple of reunions and votes were tabulated. It was decided to have the 2015 reunion in Virginia Beach. Always a good call. The rest of the day some shipmates remained in the hospitality room to relive the old days and others took the opportunity to do some local shopping and visit the beaches. The events for Saturday evening began with a social hour, followed by an incredibly long wait for the official photographer to arrive. Once the picture was taken we then retired to the banquet room to begin the activities of the evening. John Evans gave the welcoming address and this was followed by the traditional Two Bell Ceremony. It seems to become a little more emotional as each year passes. Upon the completion of the agenda, dinner was served. Funny how the noise level goes up as a group of people are eating and having fun. Once the dinner was completed, the real fun began. As usual, our famous auctioneers, myself and Jim Bunch inspired the crowd with incredible bargains brought from afar by our generous shipmates. There were items from Connecticut and as far away as Oklahoma. Some were hand made and others reflected the manufacturing or agricultural prowess of the home areas. Midway through the auction, presentations were made for the first Stinky Awards. I’m sure you have already watched the awards at the end of the movie cited above. It was even funnier in real life! These awards were for excellence in the improvisational performing arts and the scenes done on Friday evening. Best Actress went to Rosy Nikkel, Best Supporting Actress to Kit Lawler, Best Actor to Bill George and Best Supporting Actor to Clark Donnell. All were very surprised to say the least. A photo op was held at the conclusion of the award granting and as you might guess, the paparazzi were out in full force. Maybe we should have provided for extra security! The auction finished up with a fair amount of money being collected for use in holding future reunions. Sunday morning found shipmates having breakfast and preparing to leave. It is hard to say good bye after having spent an incredible week-end with the shipmates you know and love. I hope everyone missed the monsoon that descended upon Pensacola later that day and that you all made it home safely. See you all in Virginia Beach in 2015!